Water is one of the sources of energy that our bodies cannot live without. Most of our body is made up of water and therefore it requires the energy of water to be added to replenish and repair it. Water is one of the four elements which forms earths and our constitution; water being the most receptive element and the greatest receiver of energy. Every cell in your body needs water from head to toe. This is why it is so important at to drink plenty of water every day. In Ancient Greece water was not just consumed for good health but was also used as a water therapy to heal ailments. Its uses included hot salt baths, spa therapies, hydrotherapy, and balneotherapy. Herodotus, the historian and physician observed that different natural mineral springs, in various parts of Greece had different therapeutic properties. He developed a system for differentiating the therapeutic indications of various types of mineral waters. You will still find many healing natural mineral springs around many parts of Greece and the most fascinating one I experienced is in the seas of Santorini. “Not all water is the same”. “Whoever wishes to investigate medicine properly, should proceed thus: These things one ought to consider most attentively, and concerning the waters which the inhabitants use, whether they be marshy and soft, or hard, and running from elevated and rocky situations, and then if saltish and unfit for cooking; and the ground, whether it be naked and deficient in water, or wooded and well watered, and whether it lies in a hollow, confined situation, or is elevated and cold; and the mode in which the inhabitants live, and what are their pursuits, whether they are fond of drinking and eating to excess, and given to indolence, or are fond of exercise and labor, and not given to excess in eating and drinking”. “ And I wish to give an account of the other kinds of waters, namely, of such as are wholesome and such as are unwholesome, and what bad and what good effects may be derived from water; for water contributes much towards health”. The ancient Greeks had wells for water however they preferred spring water. They recognised it as nutritious because they observed how beneficial it was for plants and trees and how they grew quickly. Not drinking enough water can have some negative effects on our bodies and these include dehydration, tiredness, headaches, constipation, muscle cramps and dry skin. So how much should be drinking a day? There are many schools of thought on this one. Some say around 8 glasses a day and others 3-4 litres a day. Our bodies know what we need and they will usually tell us. So it’s important to listen to our bodies and let them guide us and tell us how much we need to drink each day. The more water the better. Below I have a picture of how I enjoy drinking my water. 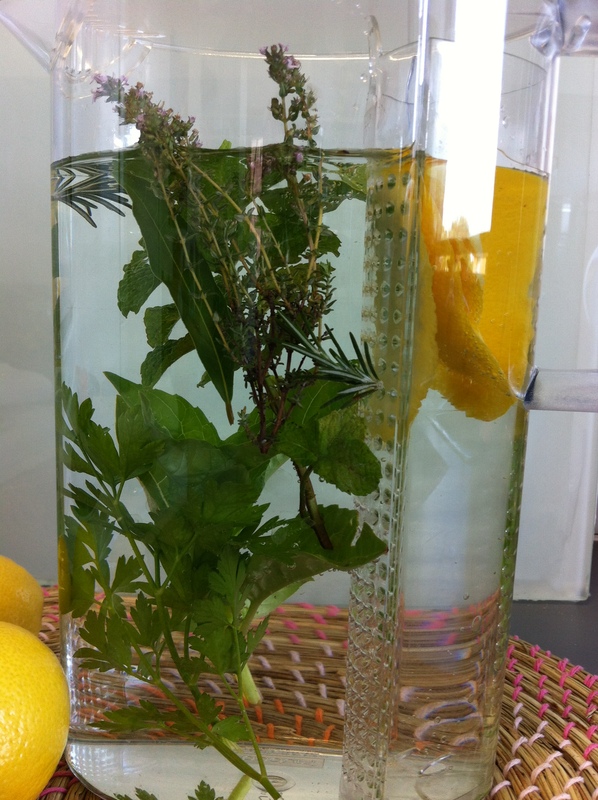 I gather various fresh herbs from my garden and place them in a water jug. I add a little bit of fresh lemon juice and lemon peel and then top up with spring water. Please use organic herbs and not conventional herbs that are riddled with chemicals and pesticides. You do not want to be drinking water and at the same time be absorbing toxins into your bodies. My affirmation: “I love my body and so I drink lots of water, freshly squeezed juices and herbal teas. Every drop of water I drink replenishes and rejuvenates every cell and part of my body”. “My body rewards me with good health”.